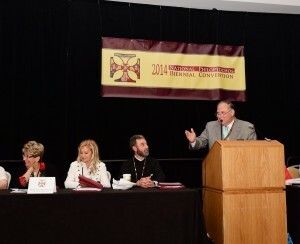 Philadelphia, PA- With a theme of “The Orthodox Christian Family: A Dwelling of Christ and a Witness of His Gospel,” chosen by Archbishop Demetrios of America, the 2014 National Philoptochos Biennial Convention was held in Philadelphia, PA from July 6 to 9, in conjunction with the 42nd Clergy-Laity Congress. A record number of delegates attended the biennial event with over 440 registered to represent the 27,000 Philoptochos stewards from across the United States. The Metropolis of New Jersey Philoptochos hosted the event in the City of Brotherly Love under the spiritual leadership of Metropolitan Evangelos. From a moving video tribute to veterans created from the personal archives of Philoptochos stewards, to a panel discussion on mental health issues in the Greek Orthodox community, to an interactive discourse on the traditional Greek diet, “family” was front and center in the program, bolstered by the Orthodox faith. On Sunday morning, delegates walked together to the nearby historic St. George Greek Orthodox Cathedral to attend the Hierarchical Divine Liturgy. Philoptochos Convention opening ceremonies commenced that afternoon with a prayer offered by Archbishop Demetrios of America and flags of both the United States and Greece presented by the Honor Guard VFW Eleftheria Post. National anthems of both countries were sung by the National Forum of Greek Orthodox Church Musicians. The following day, at a gathering that included both Philoptochos and Clergy-Laity, Ecumenical Patriarch Bartholomew I of Constantinople, the spiritual leader of the world’s Orthodox Christians, appeared via Skype and delivered a live message from the Ecumenical Patriarchate, to the joy of the delegation. 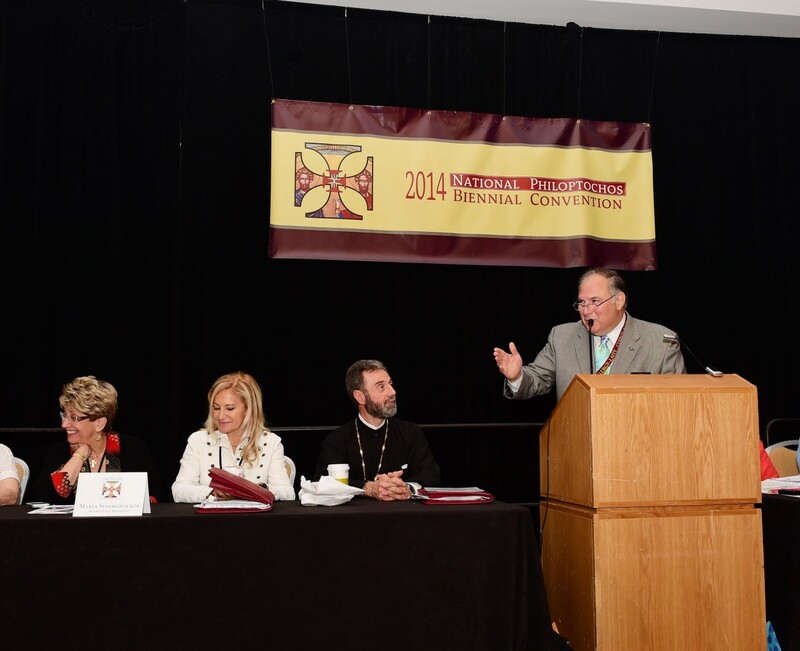 Under the leadership of National Philoptochos President Aphrodite Skeadas and Convention Tri-Chairs Anastasia Michals, Martha Stefanidakis and Evellyn Tsiadis, the program included guest speakers, professional training, and award presentations, in a framework of spiritual growth. Speaking on human trafficking was Rachel Lloyd, Founder of Girls Education and Mentoring Services (GEMS), who escaped exploitation as a teenager with the help of a missionary group. The humanitarian work borne of her struggles brought tears to the eyes of the audience. Bishop Sevastianos of Zela, Spiritual Advisor to Philoptochos, added that Archbishop Demetrios was appointed to a White House advisory council that seeks to end human trafficking. Highlights in the roster of speakers were Philoptochos members who presented the details of their “Chapter Challenge,” a two-year chapter initiative serving to answer a need in their community. Chapters met the challenge by offering projects that included distributing new shoes to needy schoolchildren, making lap blankets for the homebound, facilitating letters between incarcerated parents and their children, and deploying volunteers to a Christ-centered recovery facility. President Skeadas announced that the National Philoptochos disbursed an unprecedented $3.1 million in philanthropic aid for the two year period from January 2012 through December 2013. This was a significant achievement as fundraising was simultaneously occurring for the Philoptochos Center of Philanthropy. The Center, located in New York City and inaugurated on March 1, is now moving towards its transformation into a hub for ministries, programs and services of Philoptochos. Disbursements of donations at the Convention totaled $509,580. Included among the many presentations were: $10,000 to the Special Needs Athletic Programs (SNAP) for e-learning webinars geared for children with disabilities, $10,000 to New Alternatives for Children for family medical and mental health clinics, $5,000 to Haven of Peace for a women and children’s shelter kitchen, $10,000 to Hellenic Nursing and Rehabilitation Center for an Alzheimer’s disease and related dementia unit, and $10,000 to International Orthodox Christian Charities (IOCC) for Aid to Floods- National Emergency Fund in Serbia. Philoptochos delegates unanimously approved new budgets for 2015 and 2016 that total more than $2 million each year. Following a tradition of selecting a local charity in the host city, the Philadelphia hunger relief organization, Philabundance, was chosen as the recipient of $12,000 in donations and gift cards delivered by all the chapters and delegates in attendance which will provide funding for more than 23,000 meals. Additionally, Philoptochos aided the Veterans Multi-Service Center, a U.S. program assisting servicemen and women in the Philadelphia area. The All Generations Accomplishing Philanthropic Endeavors (AGAPE) award honored nine outstanding women of the Philoptochos Society who embody the true spirit of philanthropia, the Greek word for “kindliness, humanity, benevolence and love to mankind.” Harriet Nikolaidis, Markella Magliola, Elaine Economides Joost, Dorothy Bezemes, Vasilike Pasalis, Evanthia Valassiades, Mary Anne Pappas, Theano Peros and Artemis Sarayiotes received the awards for their dedication and inspiration. “The 2014 National Philoptochos Biennial Convention will always be a tribute to the strong, bold and decisive women of the Ladies Philoptochos Society,” said Skeadas in a statement following the event. “The expressions shared there of joy and fulfillment, compassion and sensitivity, exhilaration and elation, are a result of our beautiful, faithful Philoptochos Stewards. They are worthy and they are noble,” she stated.